TSF will be taking some time off during this mini-break in tennis news (otherwise, we risk scraping the very bottom of the barrel). Expect us back in a few weeks with coverage of the 2010 Hopman Cup and beyond. Have a nice and safe holiday, everyone! 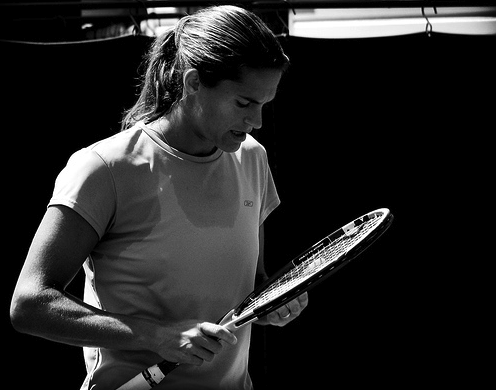 Amelie Mauresmo announced last week that she’s calling it quits from the WTA Tour. What do you think of the announcement from the two-time slam winner? We here at TSF are always suckers for cable knit sweater vests and wooden racquets, so Michael Langan‘s short film, Doxology, immediately gets a mention. Spare six minutes watching “an experimental comedy about tennis balls, dancing cars, and God”? Happy Saturday! Who knew charity could be so fashionable?! Housing Works (which happens to employ one of your TSF editors!) 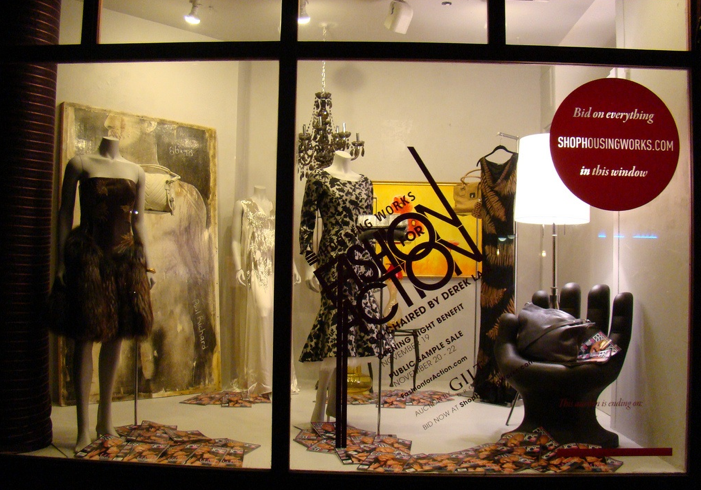 put on its annual Fashion for Action fundraiser event a couple of weeks ago in Chelsea, featuring clothes donated by designers and sold at discounted prices. The event was chaired by designer Derek Lam, and was expected to generate millions of dollars for the non-profit, which services New Yorkers living with HIVAIDS by providing housing, social and medical services and job training. How good is Patrick Rafter looking?! 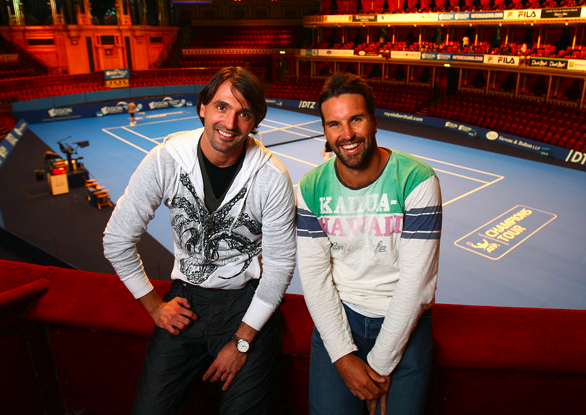 Rafter, in London for a ATP Champions Tour event, was rocking a relaxed and well-worn Hawaii long sleeve with Goran Ivanisevic. We always thought Rafter looked good, but who knew age was in his favor?! As for Goran… well, we like his watch. The relived their epic Wimbledon match in their chat prior to the start of the tournament. The James Blake exhibition Tuesday night in Manhattan didn’t just feature top-level tennis, it also featured top-level eats. 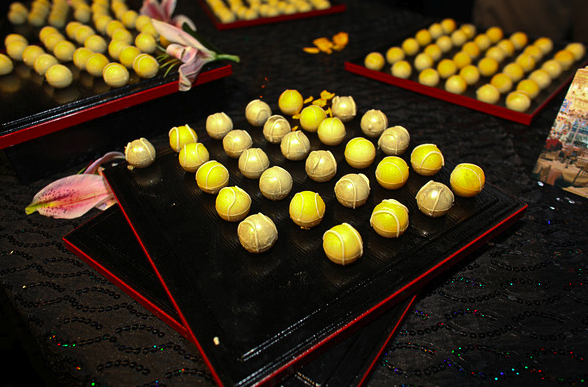 Bringing in chefs from around New York, the event had tasting and drinks from some of NYC’s most well known restaurants, including the pictured chocolate truffle tennis balls, prepared by Brian Young of Tavern on the Green. Those look delish! John Mooney, chef at the Highland Manor, was the host chef of the event, which some exhibition-goers attended following the tennis Tuesday night. 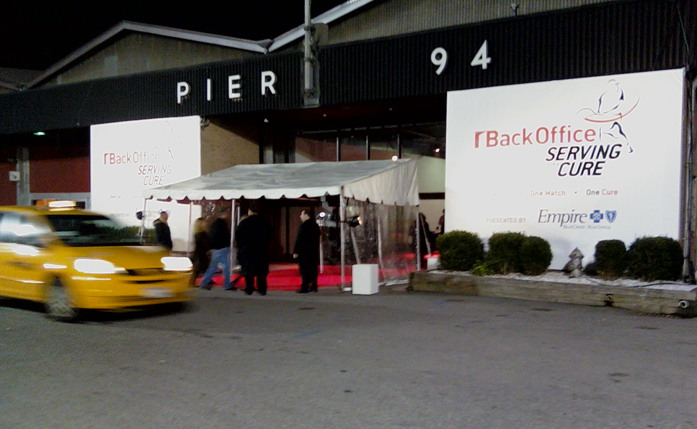 Later on in the night, Wyclef Jean took the stage at Pier 94 to perform. While we’re still waiting from images from the Fila Fashion Show that was to feature Blake’s Thomas Reynolds line, there wasn’t too much creativity happening on court earlier in the evening, as the Bryan Brothers and Sam Querrey all sported the same adidas garb, and Blake followed suit in a white shirt and black shorts by Thomas Reynolds. While we weren’t too keen on the gent’s lack of creativity on the court when it came to their apparel, we’re still hoping that we’ll find this Thomas Reynolds zip hoodie under the Christmas tree in a few weeks. Yum! See the Peacoat Hoodie after the jump. Last night at Pier 94 on Manhattan’s Upper West Side a mostly-packed house watched James Blake beat substitute Sam Querrey before the two singles players paired up in a losing effort against Bob and Mike Bryan. The event was an exhibition headlined by Blake and sponsored by Back Office Associates to raise money for the Thomas Blake, Sr. Cancer Research Fund at Memorial Sloan-Kettering Cancer Center. Andy Roddick, who was set to play Blake before having to drop out because of an on-going knee injury, made an appearance on court as “Sam Querrey’s coach”, but was visibly limping and in pain. Roddick took the microphone for much of the first set to entertain the crowd, quipping jokes at Querrey’s errors and generally entertaining the crowd with his dry, savvy humor. The night also saw Melanie Oudin make an appearance, wearing a silver sequined skirt, black heels and a leather jacket. At one point TSF overheard Melanie say her feet hurt while on the red carpet. Pain is beauty, Mel. Blake’s childhood friend, John Mayer was in attendance as well, wearing black pants and a black blazer, the pop crooner was looking just fine while sitting among Blake’s family members. We celebrate World AIDS Day today to bring awareness to such a real and current disease. 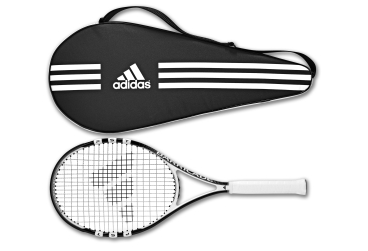 Here is a touching tribute from 2007 to Arthur Ashe, the late tennis champ. Watch the video here. 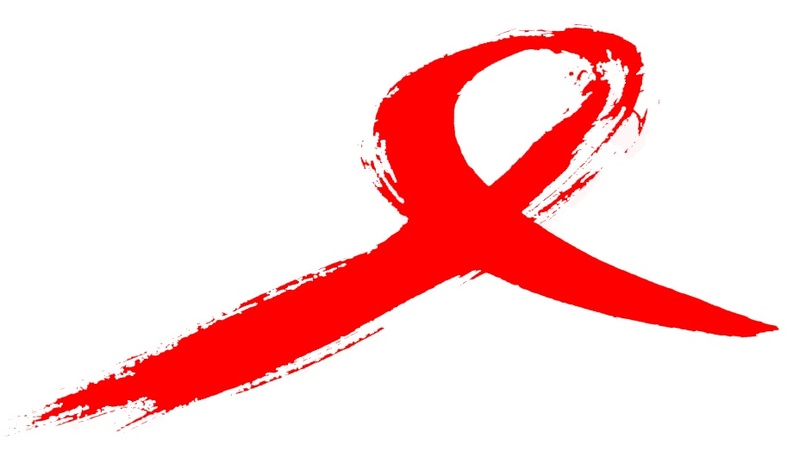 Learn more about World AIDS Day here. Last night L. Jon Wertheim spoke to tennis fans at Housing Works Bookstore Cafe in SoHo about his book Strokes of Genius while fielding questions from the audience about the legitimacy of Fed’s ’09 French win and why mainstream American sports fans just don’t understand the Rog. Wertheim spoke on many topics, but one thing he drove home was how personable Federer is, even as a world class athlete. Not sure of it? Check out this clip the CNNSI.com writer said. It’s a laugh, literally. More watching can be done tonight as the James Blake exhibition in New York will be streamed on the USTA’s web site, Livestream.com and the event’s facebook page. Blake is set to play fellow American Andy Roddick in the event that will raise money for the Thomas Blake, Sr. Cancer Research Fund at Memorial Sloan-Kettering Cancer Center. 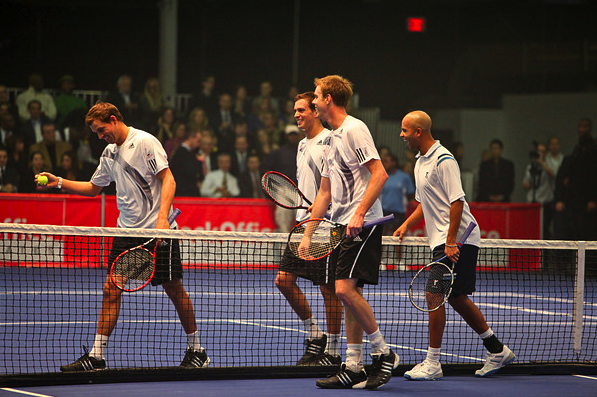 Sam Querrey and the Bryan Brothers are also scheduled to appear. Oh, and the Fed vid is posted after the jump, just in case you can’t stand to peel yourself away from TSF.